Editor’s note: We begin a two-part series on keyword research today. The following post focuses on a topic mapping and brainstorming process designed to generate a wide-ranging field of keywords. Tomorrow’s post will demonstrate how to identify and focus on the best-performing keywords through testing, competitor research, and keyword tools. Somebody types a few words into a search box somewhere in the world and the process begins. A prospective student is searching online, trying to find the right university or school, but how is he searching? What information is most important to him? What terms does he use and how can you find your way through the staggering volumes of search activity, advertising, and user behaviour to find and engage with this prospective student? More to the point, how can he find you? Education-related search activity continues to go up every year, and it remains reliably true that “non-branded search queries” account for a large proportion of overall search volumes. Google reports that 9 in 10 prospective students don’t know which school they want to attend at the onset of the search process and they reflect this non-brand orientation in their search behaviour, relying instead on queries for specific programmes or fields of study, specific levels of study or credentials, geographic queries, or other broadly structured search requests. The implication of this is that while some students may be asking for your university or school by name, many others will not. And that is where serious reflection, research, and strategy around the terms that students use when searching becomes so important. We’re talking about keywords: the terms that are most relevant and most commonly used in searches that could apply to your institution or school. Keywords have an important role to play in shaping the structure and content of your website, in your search engine optimisation efforts – that is, in placing your institutions as close to the top of the search results as possible – and in your online advertising campaigns as well. Needless to say, the process of determining which keywords are most important to your recruitment efforts is an invaluable component of online marketing. But it is also a window into the behaviour, intent, and priorities of prospective students. The “key” is to identify the terms that are most relevant to your programmes and services and that are also most-used in search queries by your prospective students. And today we’ll outline a relatively straightforward process for doing just that. First, make a list of high-level topics that are most relevant to your institution or brand. What are your key programme areas? Where are you located? Which of your services are most in demand by international students? See if you can establish between five and ten main topics that you would prioritise based on key programme areas or other features of your institution or school that you know to be important for your international students. Now break out each topic and start to brainstorm keywords and search queries that could apply to each. Imagine the terms a prospective student would use to try to find the programme or service you are offering. And so on. Don’t limit yourself at this stage because you will narrow the list down shortly. Repeat the brainstorming process for each main topic you identified earlier. If you get stuck at any point, go to your student-facing colleagues – both faculty and staff – and to the students themselves to get their suggestions, too. Remember that relevance is key, so it is better to be more specific or more closely align the search term with some distinguishing characteristic or distinct strength of your institution or school. Look over your initial keyword brainstorming for each major topic with an eye to ensuring you have a mix of short- and long-tail keywords in the mix. 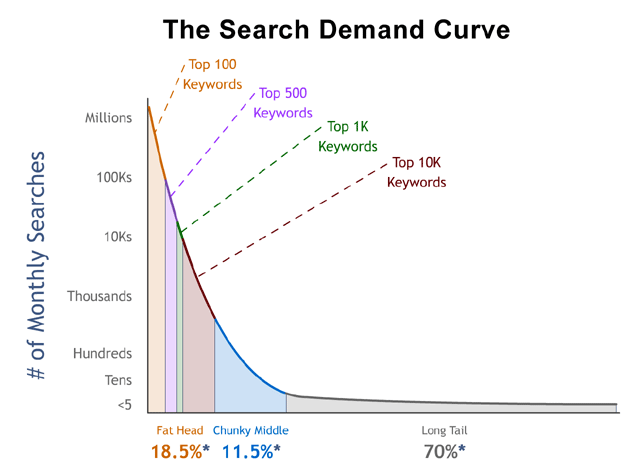 Short-tail search terms are the more general ones, and often more competitive and hard to differentiate or rank against in search results. Long-tail terms, on the other hand, are more specialised and may provide a more open field with less competition, in part because they may also reflect a more precise match between the intent of the prospective student and the search result that your institution or brand represents. To stick with our brainstorming example above, a term like “Bachelor of Business Administration” or even “Business Administration” would be very short tail. It is going to return a large number of results for schools all around the world, and may or may not provide prospective students with a good match for their interests. 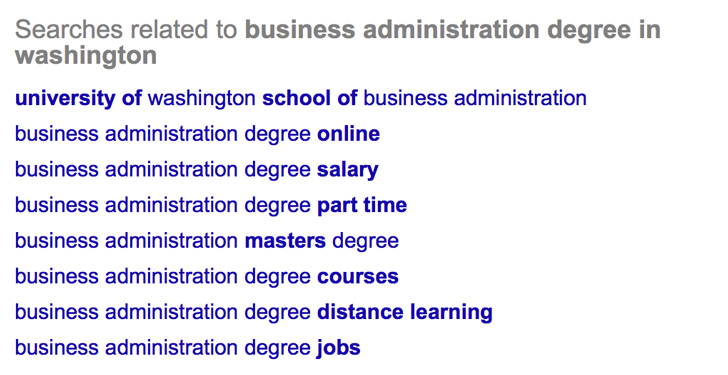 “Business Administration degree in Washington,” on the other hand, is further down the keyword tail. It eliminates all programmes outside of Washington and narrows the range to a particular field of study at the same time. Remember that the most highly trafficked terms are not always the ones that will be the most valuable to you. You want to draw not just large numbers of users but the right users: the ones whose interests and intent are most closely aligned with your programmes and services. The SEO and inbound marketing specialists at Moz point out that the most popular search terms in many categories still only account for about 30% of web searches. The other 70% are in the long tail, which is where we also tend to find search behaviour that is more specific as prospective students are further along in their decision-making process and that much closer to selecting where they will study. You can think of the process we’re outlining here as a series of sequential steps. In practice, however, you will likely find yourself moving back and forth as your brainstorming and research process continues. As you do, you will find it useful to research related search terms at different intervals. Here is a very quick and easy check to do for individual search queries: just enter the query – “business administration degree in Washington” – in a search box and check out the results. When you scroll down to the bottom of the results page, you’ll see that Google also provides a series of related queries for you. Use these related search terms as a check against your earlier brainstorming and to help you to round out the search terms you’ve compiled for each major topic. We will publish the second part of our keyword feature tomorrow, with a focus on competitor research, and handy analysis and planning tools. If you haven’t yet subscribed to our daily alerts, please take a moment to do so now in order to receive a special email alert as soon as Part 2 is published. In the meantime, happy brainstorming! This entry was posted in Africa, Asia, Australia/Oceania, Europe, Marketing, Middle East, Most Popular, North America, Regions, South & Central America, Technology and tagged online marketing, postgraduate student recruitment, primary schools abroad, international students, colleges with international students.